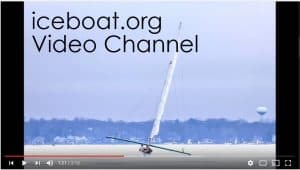 Bill Bucholz shared this video on the Chickawaukee, Maine Iceboat Club website. The ice sailing season appears to be holding on in Lac St. Francois, in Lambton, Quebec where they sailed on Sunday, April 15. The weekend snow storm makes the world feel upside down – as if it’s December and we are waiting for first sailing reports. Here in Madison this morning, there’s 4″ of snow on the ground, it’s 24 F, and it’s snowing. Mike Madge reports 4′ of ice in Thunder Bay, Ontario. There could be some more ice sailing to come.